Note: Scroll down for a quick look at the statistics. 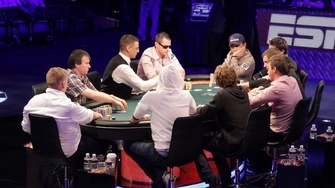 With names like Collins, Lamb, O’Dea and Heinz, you’d expect an aggressive final table, and that’s exactly what viewers got when they tuned into the unprecedented hand-for-hand coverage of the World Series of Poker main event final table. Here, we take a closer look how each of those hands played out and attempt to discover why some players were more successful than others. Those who camped out in front of their televisions for the over 14 hours of action were treated to a seemingly endless barrage of preflop aggression, but perhaps they’d be surprised to discover that not everyone at the final table was willing to put it all on the line with so much money at stake. In fact, the fates of the first two casualties at the final table were largely determined by their complete unwillingness to gamble. A quick look at the stats for both Sam Holden and Anton Makiievskyi reveal a nearly identical story. Both players played less than 10 percent of the cards dealt to them and each of them only won four hands. Because they were so short stacked, neither player could afford to take many flops and were basically pot-committed whenever they decided to enter the pot. Perhaps the only positive from their final table performances is that both players were initial aggressor on the five hands they did play and neither one was guilty of bleeding chips with passive limps and checks. Unfortunately for the two young pros, neither was able to stay ahead of the mounting blinds and antes. No one could argue that Badih Bounahra was the tightest player at the final table. The 49-year-old was even caught on camera folding pocket queens this summer during the final table bubble. Thanks to his nitty image, Bounahra was able to take advantage early on and chip up out of the danger zone, but after some initial success, his compulsion to take flops cost him most of his stack, which he let dwindle down to less than five big blinds. Of the 13 hands that Bounahra voluntarily played, he won just five. Furthermore, he lost two of his three showdowns, including the final one that sent him home in seventh place. Both Phil Collins and Eoghan O’Dea lasted about 100 hands into the final table and both players voluntarily played about 20 percent of the hands they were dealt, but that’s where their similarities end. A quick look at the stats, and at the broadcast, will tell you that O’Dea was by far the more aggressive player and it may have been the reason why we was eliminated in sixth place. Of the 23 pots O’Dea contested, he played 19 of them for a raise preflop. In fact, on 15 of those hands, he was the initial aggressor. Clearly, Collins’ preferred style of mixing in limps and preflop calls was a stark contrast in strategy. Of the 19 pots that Collins contested, he only played eight of them for a raise, choosing instead to let his opponents bet for him. It’s hard to determine who played better, because one of the biggest reasons why O’Dea was short stacked in the first place was because he got unlucky against Ben Lamb during an all-in confrontation. Then again, at least Collins managed to win a couple of showdowns, which O’Dea never managed to accomplish. There were some professional players who hypothesized that Collins was limping into pots in order to set up a more profitable situation later on, when he actually had a hand, but unfortunately, he wasn’t around long enough to capitalize on that dynamic. There’s not a lot to critique about Matt Giannetti’s final table performance. He played 38 of the 178 hands he was dealt, which at 21 percent, is a perfectly acceptable number. Furthermore, he managed to win 28 of them, including five showdowns, which allowed him to chip up nicely early on. There are some who think that Giannetti was a bit too liberal in defending his blinds, but his decision to defend somewhat handcuffed both Martin Staszko and Ben Lamb on his right. The only real problem during Giannetti’s stay at the table was Pius Heinz, who made it a habit of three-betting his initial opening raises after O’Dea and Collins left the table. During the 78 hands dealt during four-handed play, Giannetti opened for a raise 12 times, only to lose eight of those hands. In an effort to keep up the pace, he started to three-bet raises by both Staszko and Lamb, but it couldn’t create enough of a buffer to soften the bad beat he took on hand no. 174. Had his pocket jacks held against Lamb’s A-7 suited, Giannetti would have been vying for the chip lead three-handed, not to mention about $1 million richer. There are many who are going to question Ben Lamb’s play at the final table, pointing out the two instances where he got lucky to survive, but it’s important to note that while short-handed play proved just how aggressive he could be, Lamb really didn’t get involved in the early going. In fact, Lamb only contested 18 of the first 100 hands dealt. Overall, he played over 29 percent of his hands, which just proves how much he shifted gears once the table reached four-handed play. It is unclear, however, just how much the ESPN coverage affected Lamb’s decisions. Was he simply trying to move up the pay ladder before getting involved or was Lamb trying to play his cards close to the vest, knowing that his opponents would eventually be clued into what was happening at the table. Because ESPN only revealed the cards that the players chose to play, the more passive players’ main objectives were kept secret and the more aggressive players (see O’Dea and Collins) were left exposed. Luck aside, Lamb had a legitimate shot at the title. Had his K-J connected with the board on a crucial coinflip against Martin Staszko, he would have entered heads-up play in a near tie for the chip lead. Instead, he made his exit in third place. When analyzing both Pius Heinz and Martin Staszko’s play at the final table, it’s important to distinguish between their strategy before and after heads-up play began. A quick look at the accompanying chart will show that Heinz and Staszko played 55 and 44 percent of their hands, respectively, but those figures are skewed by the fact that they were heads-up for 119 of the 301 total hands dealt at the final table. Staszko came into the final table with a sizable chip lead, so its understandable that he started off patient, waiting for a few players to bust before leaping into action. Heinz, however, came into the final table in seventh place and was forced to make something happen right away. Through the first 50 hands, he had won ten pots with either a raise or a three-bet, but it wasn’t until he eliminated Anton Makiievskyi in eighth place that he began to put his newfound chips to work. By the time heads-up play began, Staszko had more or less caught up. Both Heinz and Staszko then traded jabs for 119 hands. Heinz won more than his fair share of the pots with 69, but the German pro lost the majority of the big confrontations, allowing Staszko to take a sizable chip lead. All things considered, Staszko probably played well enough to take the title, but luck wasn’t on his side. When Heinz moved all in on a flop with just an ace-high gutshot straight draw, he could never have imagined that he was ahead of Staszko’s smaller gutshot and flush draw. Somehow, his hand held up to give him the crucial pot, the momentum and eventually, the bracelet.